I just saw this and thought of all my wonderful readers that have kitties of their own, and I just knew you would really enjoy seeing/creating this for yours. I think it’s so clever and such an adorable little house for your special furry friends, take a look! Like they even NEED another place to sleep, I decided the other night to make them a little cat house from some boxes we had in the garage. This was inspired by a little gingerbread cardboard house that we found on sale at Aldi’s for $7.00. I love cats! So i can understand!! I have doggies but lots of friends here have cats, so I just had to share. 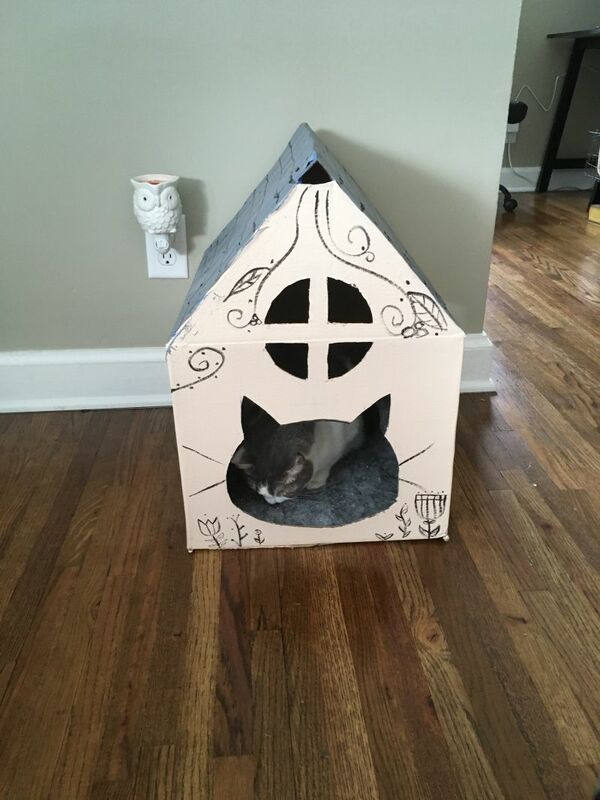 It could be a dog house too! I thought is was too!! Love projects that are made easily on dime! This is adorable! We had something similar at some point, before little Pyshka joined the family, but Beba used to scratch cardboard and shreds would get embedded into the rug, so we had to get rid of it.